So, basic black is a staple in most women&apos;s wardrobes right? The majority of us have a go-to little black dress for instance. Who doesn&apos;t have a pair of go with everything black pumps? And not enough can be said for how many ways a basic black blazer can be worn. But we&apos;re not here to talk about basic black today. Let&apos;s go a step beyond basic and think about black bags and shoes with special details that make them anything but ordinary. It&apos;s all about the details baby! I&apos;ve always worn a lot of black in the fall. 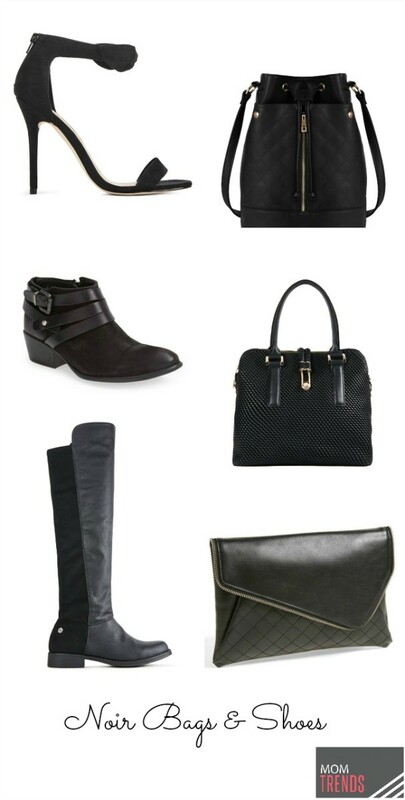 While I love rockin&apos; beautiful fall and winter hues like jewel tones, there is something so chic and edgy about black and even if you don&apos;t want to go head to toe with your black, I urge you to add some special noir pieces to your fall wardrobe this year. They&apos;ll go with nearly everything! And they will seriously jazz up your looks. Let&apos;s start with bags. There are three types of bags that I consider must haves this season. The bucket bag, the satchel and the clutch. Every girl needs a date night clutch and texture makes the one I featured so much more interesting. In fact, all three of the bags I rounded up have some type of cool texture. As far as fall footwear goes, you can&apos;t go wrong with knee high boots, booties and a great pair of date night heels. Can you tell I&apos;m all about date night right now? It&apos;s been a while. Haha! What I love about these ankle strap heels is the fun knot detail. They might not work when snow is falling, but you can get away with them this fall before it gets TOO cold!